Photos of the plane crash near Bigelow Mountain taken from the Forest Service Helicopter. A Vermont couple flying a small plane bound for the Greenville International Seaplane Fly-in crashed near Bigelow Mountain on Thursday morning, a state police spokesman said. Pilot and plane owner Frank Gibney, and passenger Diane Muhr, both of Colchester, Vermont, were not injured in the crash, said Stephen McCausland, spokesman for the Maine Department of Public Safety. Their plane crashed around 10:30 a.m. in a wooded area near the mountain in Wyman Township north of the Carrabassett Valley. The pair then hiked about ½ mile up the mountain and walked out of the woods to the Appalachian Trail, which runs through the region, where they met first responders, according to officials. 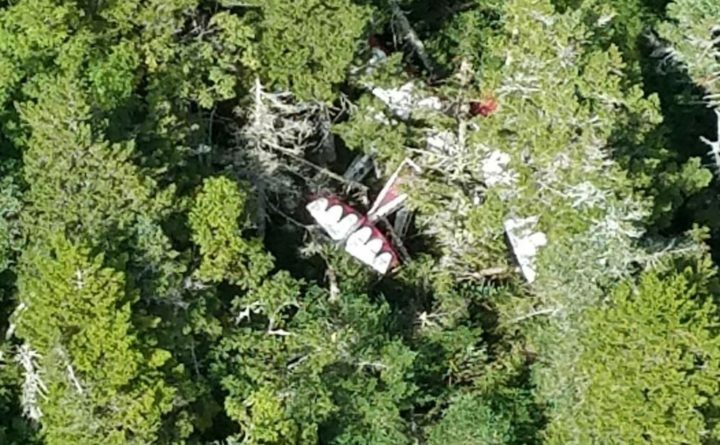 Gibney told police he was flying next to another plane piloted by a friend when he lost visibility from the weather and his float plane crashed into the trees. The friend notified the Maine Warden Service Office in Greenville, according to McCausland. Gibney and Muhr, who are both in their mid-60s, were flying to the Greenville Seaplane Fly-In, an annual event in the Moosehead Lake region that typically draws several hundred planes to the area. The event is being held this weekend with registration beginning Thursday. Maine state troopers, forest rangers and game wardens responded to the scene. A Maine Forest Service helicopter helped transport first responders — from Eustis, Kingfield and Carrabassett Valley — closer to the crash site. The FAA will send an investigator to the site to learn more. Thursday’s was the third small plane to crash in Maine in a little more than a month and the second to go down in the mountainous western region of the state. On July 30, a plane headed for Prince Edward Island crashed near the Greenville Municipal Airport and killed three members of a prominent Canadian family. On Aug. 23, a Customs and Border Protection Plane crashed on the Pittsfield-Burnham town line when its engine failed, and its two passengers escaped the wreck without life-threatening injuries.